This is funny..lol..So,a man has attempted to break the internet with a rather controversial birthday photo which has set the internet rolling. The man who took to his social media page on Facebook to wish himself a happy birthday shared photos of himself and his mother seemingly reliving childhood memories of bathing and bottle feeding. The man who chose not to cut cakes or take friends out was seen in the photos shared on social media stripped to his underpants as his mother bathed him and bottle fed him. The middle-aged man’s move has however sparked several reactions online as several have questioned the moral uprightness of the photos which were take in celebration of his birthday. Tuko.co.ke reported that the man asked his mother to bottle feed him as his birthday wish and also bathe him just the way she did when he was a child. 0 Response to "Isn't This Lovely?! 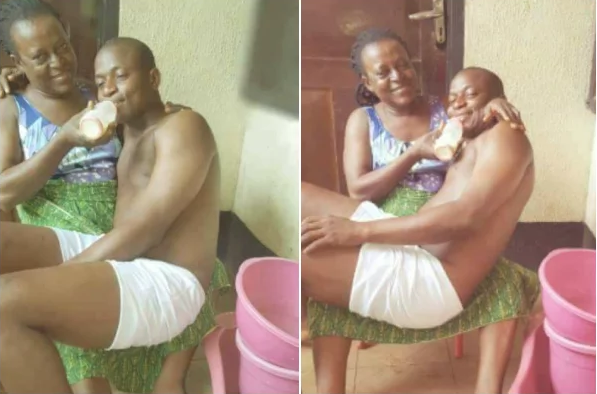 Grown Man Breaks The Internet With Mother As She Bathes, Bottle Feeds Him"